Afterglow Cosmetics offers free shipping on any purchase. No code needed. Valid for Aug 1 only. Ahava offers Buy 1 and Get 1 Free with any best selling hand or foot cream. Plus you can Mix-and-Match as well. Enter code 2FOR1HANDFOOT at checkout. Valid thru Aug 4. Bath & Body Works offers 20% off any purchase. Enter code LOVE20 at checkout. Valid thru Aug 5. Beautorium offers 10% off John Masters Organics products. Plus receive a free full size Dry Hair Nourishment & Defrizzer with $70 JMO purchase. Enter code JMHAIR at checkout. Valid thru Aug 7. Beauty.com offers free full size Sibu Beauty Sea Buckthorn Seed Oil with any $10 purchase. No code needed. Must enter thru link. While supplies last. Beauty Bridge offers 15% off storewide and 20% off Sun Care & Tanning. Enter code summerend at checkout. Valid thru Aug 15. BioElements offers $17 off when you purchase Pumice Peel and Restorative Clay together. No code needed. Limited time only. Cosmetic America offers 10% off sitewide. Enter code TU2E5 at checkout. Valid thru Aug 5. Dermstore offers free shipping and mystery gift with any purchase. Plus receive a Super Set of your choice (valued up to $270) with any $100 purchase. Enter thru link. While supplies last. E.L.F. Cosmetics offers Studio 11-pc Brush Collection Set for only $0.88 (regular price $30) with any $30 purchase. Add the brush set to your shopping cart and enter code BDBRUSHES at checkout. Valid thru Aug 5. Elizabeth Arden offers 35% off storewide (including Prevage). Enter code SLICKDEAL35 at checkout. Limited time only. CANNOT stack with Glam Bag code below. 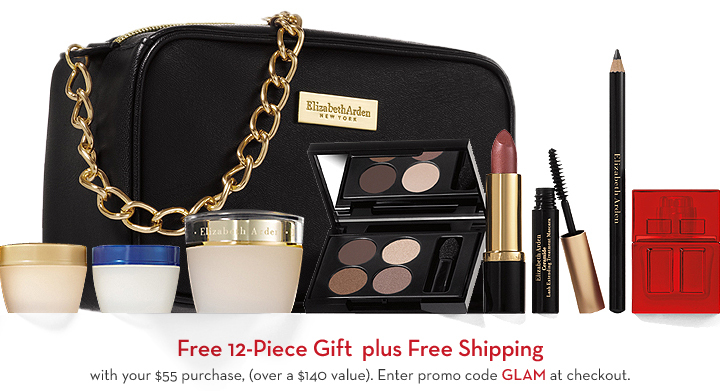 Elizabeth Arden offers free 12-pc Glam Bag (a $140 value) and free shipping with any $55 purchase. Enter code GLAM at checkout. Valid thru Aug 16. Erno Laszlo offers free 3-pc Radiance Essentials Gift Set with any $100 purchase. Gift includes 40ml Luminous Intensive Decoliete Treatment SPF 20, 40ml Luminous Intensive Hand Treatment SPF 25 and 15ml Moisture Firming Throat Cream. Enter code GLOW101 at checkout. Valid thru Aug 2. Everyday Minerals offers free mini Glam Guru Blush with any $24 purchase. Enter code GLAM at checkout. While supplies last. Fresh offers free deluxe sample size Soy Face Cleanser with any $100 purchase. Enter code SOY at checkout. Valid thru Aug 3. Juice Beauty offers free shipping with any $30 purchase. Enter code FREE30 at checkout. Valid thru Aug 3. MAC Cosmetics offers free shipping with any purchase. Enter code TOOLS at checkout. Valid thru Aug 5. Mario Badescu extended their offer of free shipping and free travel size Summer Shine body lotion with any $50 purchase. Enter code SHINE50 at checkout. Valid thru Aug 3. MyChelle offers a free Bag from LiveWorldly (a $30 value) with any $100 purchase. In addition, 5% of your order will be donated to the non-profit Water For People. No code needed. Valid thru Aug 12. Origins offers free shipping and a 3-week supply of anti-aging moisturizers with any skincare purchase. Enter code START for Starting Over Age-erasing Moisturizer, or code YOUTH for Youthtopia-Lift Firming Cream. Valid thru Aug 7. SkinStore offers 15% off sitewide. Enter code GOLD15 at checkout. Valid thru Aug 13. Time to Spa offers free shipping and free 5-pc Elemis Radiant Resurfacing Collection (a $80 value) with any $75 purchase. Enter code RESURFACE at checkout. While supplies last.